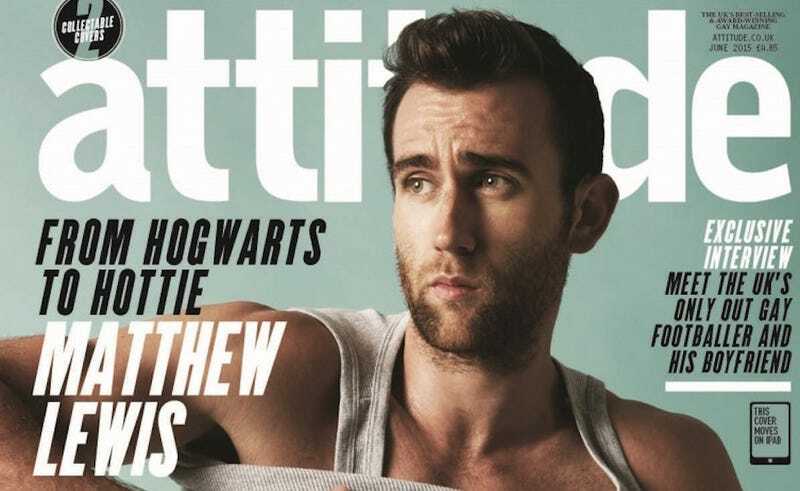 Anyone who’s been waiting for Matthew Lewis to make his debut as a cover model since they saw this gif set of him dancing half-naked and oiled up can now finally breathe in relief. The 25-year-old best known for looking British as hell in the Harry Potter movies is in a new romantic comedy and he posed for Attitude’s swim and underwear special to talk about the movie, his physical training regime, and also to show off exactly what he’s got going on under those wizard robes. Check out these hot pics of Lewis just chilling in his tighty-whities and then also posing with his shirt half-off on the magazine’s cover. It’s almost as if his tank top has been enchanted by the Wingardium Leviosa—that’s LeviOsa—spell and he’s trying to hold it down. But it will not be held down! It will never be held down again! This issue of Attitude, which is available now and features interviews with Marina and the Diamonds and what looks like a lot of ads for Hugo Boss, also has an alternate cover which features the “world’s hottest math teacher/underwear model” posing in a speedo. I haven’t bought an issue of Attitude in...ever, but I might go down to my local bookseller’s and pick up a copy. Also: J.K. Rowling is not pleased.